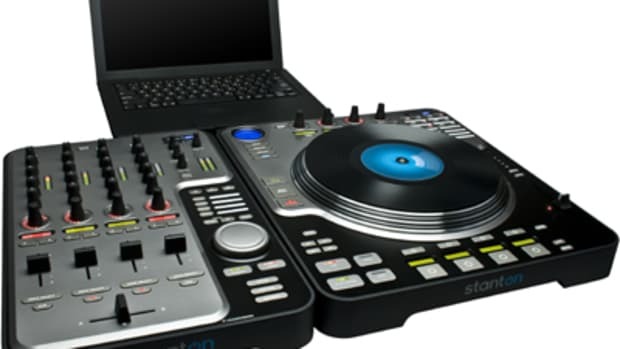 The Stanton M.203 is the recently-released entry level scratch mixer that does many things well, all for an easy $100. The Stanton M.203 comes sporting the same all-steel rugged chassis and color scheme as its bigger brother, the Stanton M.207. Also included is a nice Alpha Crossfader (with switchable curve controls) and a full 3-band EQ for each channel. Stanton was gracious enough to send a unit to me as soon as they hit the market and I was happy to put it through the paces. 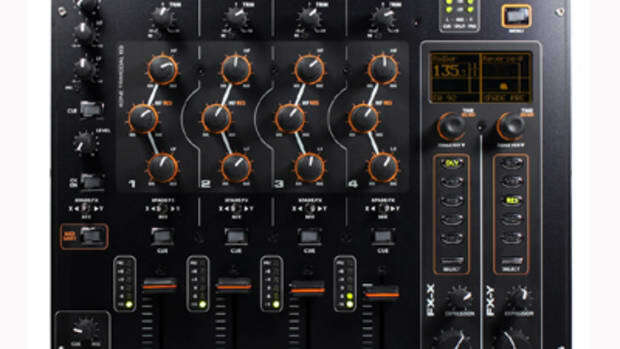 The Stanton M.203 mixer is the new entry-level-two-channel DJ mixer that is arguably the BEST value for the money in the entire scratch DJ mixer market. The Stanton M.203 is the “little brother” mixer of the highly regarded Stanton M.207 professional scratch mixer (which we reviewed earlier this year). At first glance, it is very easy to see that the styling of the Stanton M.203 follows in the footsteps of its “bigger brother”, the Stanton M.207. They share the same all metal/steel construction, making the M.203 very sturdy and rugged. Even though this is the entry-level battle mixer, Stanton did not cut any corners in the construction of this mixer. It really feels solid all around. The color scheme is also nearly identical to the Stanton M.207 with the gray area in the center ‘housing’ all of the channel functions and the darker outer area handling all the headphone and microphone adjustments. The smooth fader caps and rubbery-thick control knobs on the Stanton M.203 are all exactly the same as those found on the Stanton M.207. The fader caps are smooth enough for continuous scratching without causing discomfort. The same is to be said about the rubbery control knobs. They are soft and won’t cause any issues when trying to achieve the perfect levels of the various functions. The setup of the Stanton M.203 mixer was just as easy as any other 2-channel mixer out there. All that I had to do was plug in the two RCA cables for my Denon DN-S3700’s into the Line input on channel one and channel two. Then I ran the RCA cable from the master output on the mixer to my Crown Amplifier for sound. Plug in your headphones and microphone (if needed) and we were all set to go in under three minutes. The Crossfader found on the Stanton M.203 mixer is a 45mm user-replaceable high-quality and ultra-smooth Alpha fader. Some will say that the Alpha faders don’t last long or they aren’t good enough for today’s Scratch market, but I must disagree. The Alpha faders aren’t as good as a Pro-X-Fader or an Inno-fader, nor do they have the fine-tune adjustments available on the high-dollar faders; but I can honestly say that I can complete any difficult scratch on an Alpha fader that I can pull off on any of the others. Furthermore, I have been using Alpha faders for quite some time and reviewing them on other mixers and have had absolutely NO issues with them at all. They always seem to hold up to heavy turntablist abuse without bleeding, crackling, or any signs of degradation. 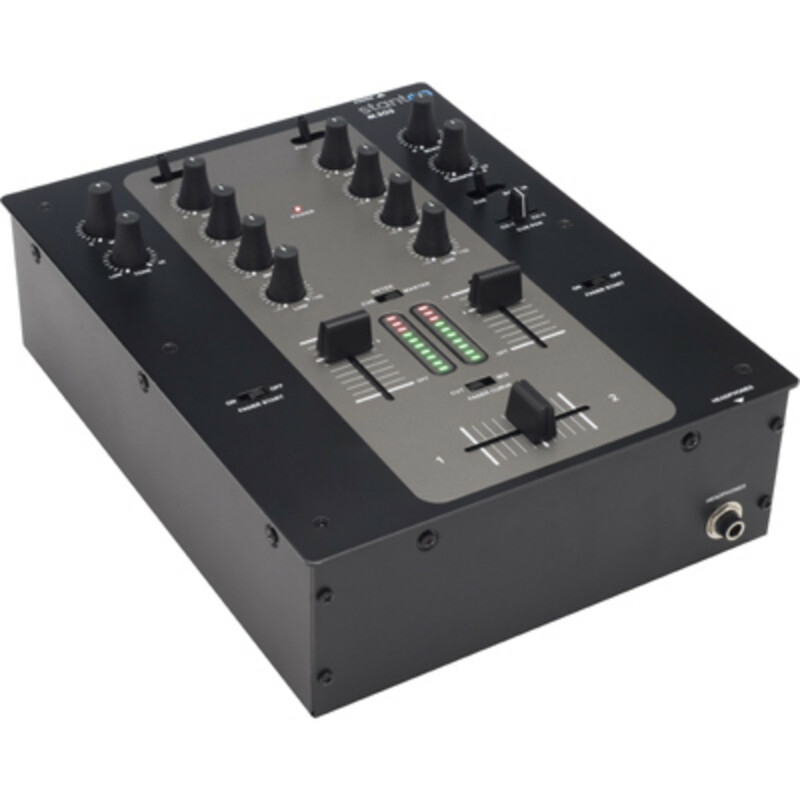 Also, keep in mind that this entire mixer sells for $100 which is actually the price that a DJ would pay for the highly tunable faders by themselves. After looking under the heavy-duty steel faceplate, the Alpha fader itself is a short-body fader that Stanton used as its M.207 Linefaders, but it seems to be replaceable with any fader that can also fit inside the Stanton M.207 mixer as well. There is a huge empty area underneath the crossfader so a DJ can fit a Pro-X-Fader with slight modification if desired. There is no circuitry or plates blocking this area at all. The crossfader has a switch-type curve control which can either be set at “cut” or to “fade”. When the switch is in the fade position, then the crossfader will gradually fade between the two channels. It is a gradual fade to the middle of the crossfader for both channels, meaning that at the middle of the crossfader, both channels play at 100% volume. When the switch is in the cut position, then the setting is perfect for scratching. The cut in travel distance is very small (2mm or a bit less) making crab, transformer, and chirp scratches very easy to pull off. I didn’t have to adjust my style to fit the cut-in time of the fader. It was just very easy to set up the mixer and immediately start scratching as normal. The line and crossfaders are both the same. The Crossfader will feel a bit more dampened due to a 1/2inch spacer lengthening (the space between the fader cap and the fader), but they both have the same, long-life cycle. Still, the linefaders are not as smooth to the touch and not really meant for scratching as is the case with the Crossfader. They feel a bit more stiff, but I was still able to pull off some basic baby scratches and fade scratches with them. There are no curve control switches for the Linefaders, meaning they will only have a fade-type setting for use. I don’t think these faders can be replaced with another type of fader as there is all types of circuitry and plates blocking the area just underneath them. Even if you could, it wouldn&apos;t matter because there is no curve adjustment for them anyway. If they are replaceable, it will be the short-body fader type only. Another minor letdown is the fact that there are no fader reverse functions found anywhere on this mixer. The faders overall will suffice for beginners in the scratch DJ community and they should last at least a few years. The faders were adequate for my needs and I would like to think that I am past the beginner stage when it comes to scratching. Each channel has its own 3-Band EQ control knob which represents the LOW, MID, and High range. They offer complete kill on all three ranges. The sound quality of the Stanton M.203 mixer is definitely high just like the M.207. I am no audiophile, but volume and EQ levels always sound crisp and smooth with a punchy bottom end. 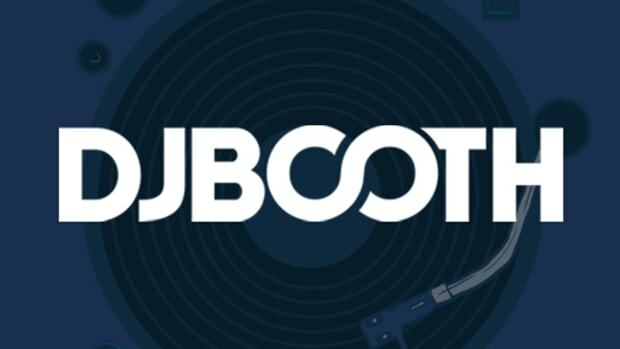 More than adequate enough for most DJ sound quality needs. 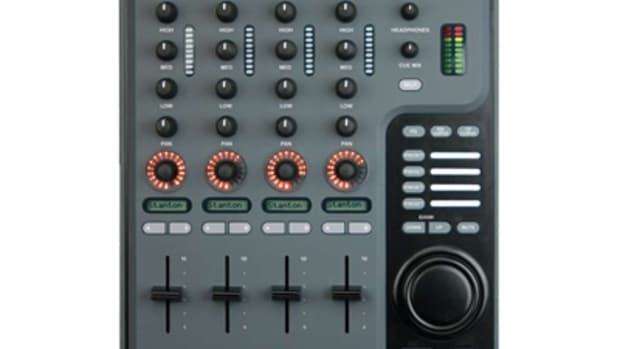 The Microphone controls are found on the far left of the mixer and they include the volume control knob and the TONE control knob which can change the Low or HI tone of the microphone output. The Cue section is located on the right of the mixer and includes a CUE PAN small fader, a CUE/MASTER switch, and a headphone volume control knob. All of these functions worked just as they should with no issues to point out whatsoever. In between the line faders is an LED meter which can be set using the switch to show the level of each channel either in the monitor (headphones) or what is actually being played through the master output. The Stanton M.203 mixer comes with two RCA style outputs; one labeled as record and the other as the master. Each channel has a Line RCA input and a Line/Phono RCA input that can be changed by the flick of a switch depending on the use of analog or digital device connections. 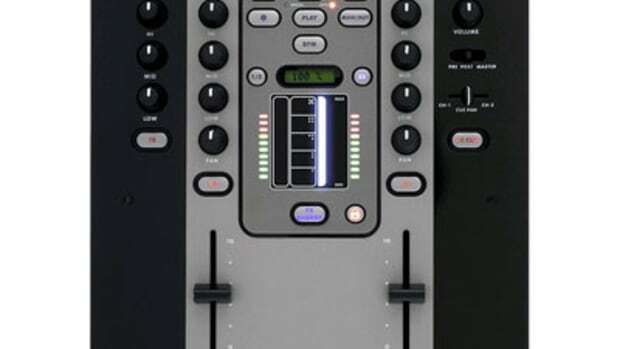 There is a ¼-inch Microphone input on the back along with two CH1 and CH2 Fader Start Mini inputs for digital decks with the fader-start capability. Last but not least, is the Headphone input found on the front panel of the mixer which is also ¼-inch. 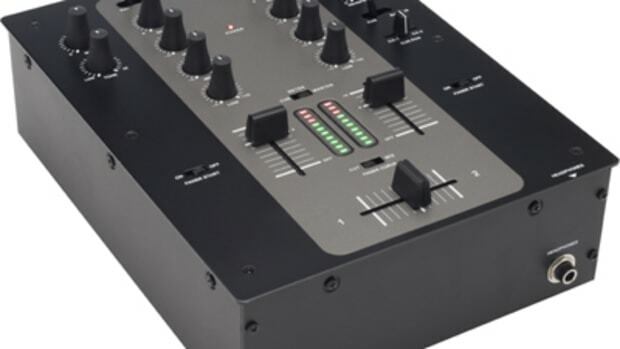 The Stanton M.203 mixer is literally, the best two-channel mixer any DJ can purchase for only $100. The only mixer that I can say comes close is the American Audio QD5-mk2 which is priced at $150 but is also a very worthy entry-level scratch mixer. The overall quality of the mixer is exceptional. It is built with the same materials (all steel inner chassis) and workmanship found on the much more expensive Stanton M.207. The included Alpha Crossfader is more than adequate enough for beginners and veterans to pull off their entire scratch inventory without fear of destroying its integrity. The crossfader can be replaced by a Pro-X-fader with a cable modification for those who really need the next level of fine-tuning capability. The lack of Fader Reverse function and line fader curve control is a bit of a letdown, but then again, at this price-point, it’s hard to complain.